Ted Cruz is running for reelection in Texas trying to humanize himself by talking about basketball, and accusing his opponent, Beto O’Rourke, of liking tofu, hating the national anthem, and plotting to ban barbecue. What’s notably missing from Cruz’s campaign message is any recognizable conservative program. The conservative agenda has become at best a distraction, and at worst a liability. Cruz’s gambit is revealing, because Republican leaders have been insisting that their policy agenda is widely loved by the public. For weeks, they have been planting the excuse that the only reason they might lose the midterm elections is Donald Trump’s erratic personality. “The decline in unemployment and soaring gross domestic product, along with the tax overhaul Republicans argue is fueling the growth,” reported the New York Times recently, “have been obscured by the president’s inflammatory moves on immigration, Vladimir V. Putin and other fronts, party leaders say …” “If we had to fight this campaign on what we accomplished in Congress and on the state of the economy, I think we’d almost certainly keep our majority …” a Republican involved in running the midterms told Axios. “If there was any way to reduce the noise (unlikely!!) we could survive. [There’s] so much noise [that it doesn’t] allow people to realize economy/life is good.” Americans would remember how much they love and cherish the accomplishments of the Republican Congress, if the president would just pipe down. Of course, if voters like the Republican policy agenda, there is nothing stopping candidates from trying to remind them of all their good works. If you recall, during the debate over the tax cut, Republican leaders continually insisted the tax cuts would be popular, and if enacted into law would provide the basis for their candidates to campaign. But the tax cuts remain unpopular, and Republicans have stopped talking about them. In any case, this explains why Republicans have stopped touting their tax cuts. And while Trump’s constant scandals — or “noise,” as his co-partisans euphemistically put it — may not be helping, they are not obscuring some kind of underlying winning message. That’s why Republican candidates are not trying to focus on domestic policy, but instead running as mini-Trumps of their own, emphasizing symbolic cultural fights designed to whip up ethno-nationalist fervor. Cruz’s campaign is especially poignant. Rafael Cruz Jr. was almost literally raised from birth by the conservative movement. Sired by a right-wing father and taught to recite Milton Friedman, Ludwig von Mises, and other great works of the reactionary canon, hanging out at the “Free Enterprise Institute” as a teenager, Cruz plotted out an ascension within Republican politics that would fulfill the great dreams of the Goldwater and Reagan revolutions. 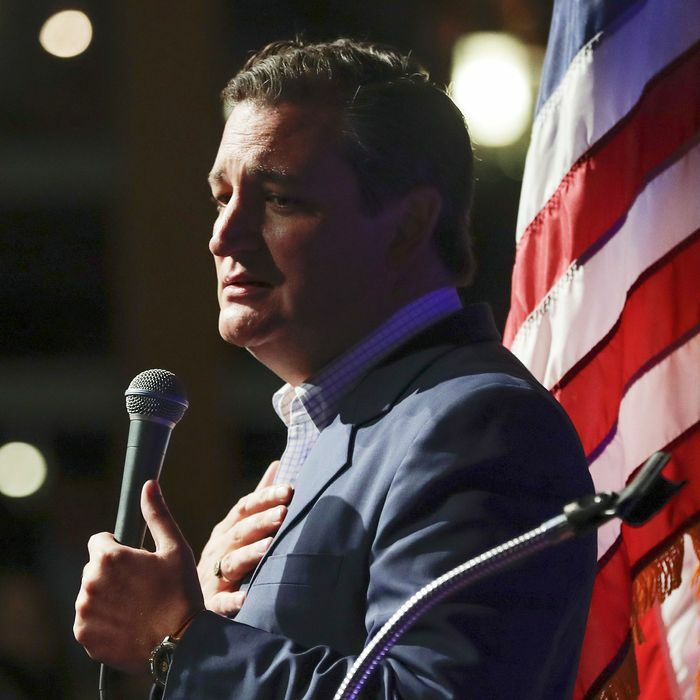 And yet, in this pivotal moment in his career, facing a surprising reelection threat from left-leaning Beto O’Rourke, and running in a state that has voted Republican in every presidential election since 1976, conservative thought is almost completely absent from Cruz’s campaign themes. His television ads tout Cruz’s record in securing federal hurricane relief for Texas and attack his opponent. (What would Ludwig von Mises think?) Cruz’s role in supporting Trump’s conservative policy accomplishments goes unmentioned. O’Rourke opposed the Trump corporate tax cut. He is openly endorsing that his state accept the Medicaid expansion created by Obamacare. If even a conservative movement fundamentalist like Cruz doesn’t want to campaign on these issues in a state like Texas, what does that say about the political health of conservatism?